Fan 1st Day Collection Opening Fan Friday Box Office Business and Occupancy Report: Shah Rukh Khan’s Fan movie has hit the theaters this Friday. The movie made to watch in theaters is filling fast with sky high speed, almost all prime time tickets are already stock out. By the end of the first day, Fan has already shattered a lot of BO records. The final report will be get updated by shortly. SRK has an immense following among all the Khans in Bollywood. So called, Badshah, did he manage to prove his worth at the box office on day 1? Make your guesses. SRK’s, the craze has just done it again. It has earned 20 cr. BB made 27 crores on day one whereas Dilwale had made 30 crores approximate figure, we came to know after discussing with theater owners and the BO analysts. When it comes to worldwide gross, BB made 46 crores; the final figure of Fan business is awaited. Most of the theaters in Delhi and Mumbai have around 80% of occupancy advance booked for the FAN Movie, whereas a great craze for Shah Rukh Khan’s movie can be seen in Dubai and UK too. BB had around 70% occupancy as advanced booking. BB joined the 100 crore club in 3 days. The SRK starer flick will make it in some days anyhow. Fingers crossed, the makers are turned with this competition. Fan’s budget was around 100 crores, and the movie is ready to reach it just two days. That’s the stamina of SRK in Bollywood and no wonder he is the Badshah. The talkie will be released in 3500 screens in India, whereas it will be in around 1100 theaters from overseas market. Since the IPL season is going on and the Navaratri is also going to fall tomorrow, as a holiday, the movie could do tremendous business in India. But the makers have expected the occupancy to be around 55%-60%. Wait and see how it goes. Do come back for more box office updates. Rehne de bhai, tu nahi samjhega. Ajay can u share screenshot? If you don’t find it cool, then you don’t know what acting really is….. There isn’t any actor in the world who can play gaurav’s character…. Very nice I also saw this movie on 1999. यार शाहरुख डोळ्यात पाणी आणलस ………. खूप सांगून गेलास ……….. thank you …..
its a ultimate movie and of course srk sir ki to baat hi alg hai so to kuch b bole wo ek patent line ban jati hai……love u sir…..
SRK was the king and he will be the king till the end. All the haters should shut their mouths….SRK’s FAN has broken all the records. Hi I am Amer ……..
super douper hit hit …..
thanks for given best movie in the world…. Really a gud movie.. srk proved once again why he is king of bollywood.. Follow kiya twitter pe, tag nahi kiya tha facebook pe kyunki account nahi khola tha lekin aaj kholdiya sirf iss gane ki wajah se aur tumhare liye, tag bhi kardiya. I am your die hard fan @iamsrk. You are the love of my life. I couldn’t be more proud of your work. 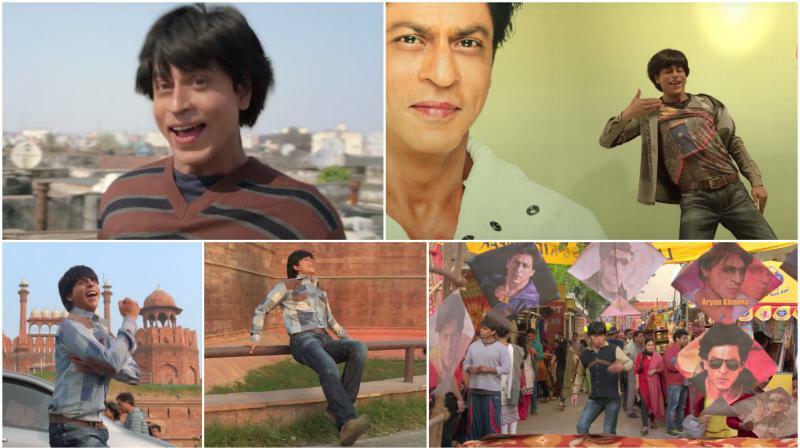 Gaurav steals the show in #FAN. COULDN’T STOP MY TEARS FROM ROLLING DOWN MY CHEEKS. So, proud of being your FAN. I hope oneday you will know me too. Till then Love you. Today Thought about u Yar something with u luck,destiny but I realized u have an acting that’s made a superstar. Kisiko neglect korne se pehele apna akat ka vi choso..
After a long time I saw a very well India movie ,thanks srk. Fan is Nice and Different Movie, Like it…..
superb story…. & no doubt superb superb superb acting by The king…..King is always king…..u r d bst “srk” sir. This is another block buster by SRK, he made a new line for acting skills…. I don’t think anyone is just nearer to it….. This is the thing srk is known for…. What an performance….. Loved very much…. Thanx for this movie…. My king khan SrK ? KHAN ka matlab sirf ek KHAN.. The great Srk Amazing Actor……………. SHAH RUKH KHAN is a best in bollywood that we all know and he the fan movie is very great and hope so fan is going to break the all records. Srk the ultimate king of bøllywoođ.. <3 rockxz..
SRK naam hi khafi hai……. Mind blowing movie this is SRK. It made 20 crores on its first day and you are saying that it will earn 100 crores in 2 days. Are you kidding me how can a film earn 80 crores today. Atleast get your calculations right man. Luv the movie #fan….mst acting ki h srk ne yaar….beated bajrangi bhaijaan…..
Ajay best reply. Book my show wala. Proof??? Shah Rukh is the best actor in the world. Mast movie hai…those who love only salman’s movie..they doesnt even know a slightest kind of creativity…go watch bodyguard or dabangg..
SRK Excellent performance in FANNNNNNNNNN don’t Miss it enjoy the FANNNN who r real fan of heros.